I thought I would share some food items I have discovered in recent weeks. It goes without saying please do check labels to make sure these products are suitable for YOUR dietary requirements. I do eat products which contain gluten and wheat, I avoid dairy and eggs. Nom Bars - I heard of these via twitter and had been keeping an eye out for them. When I opened up the packet it did not look that exciting but it delivered on flavour. Perhaps a little on the expensive side (£1.59) and not many stockists but I recommend giving a try if you like oaty snack bars. Click here to view website. 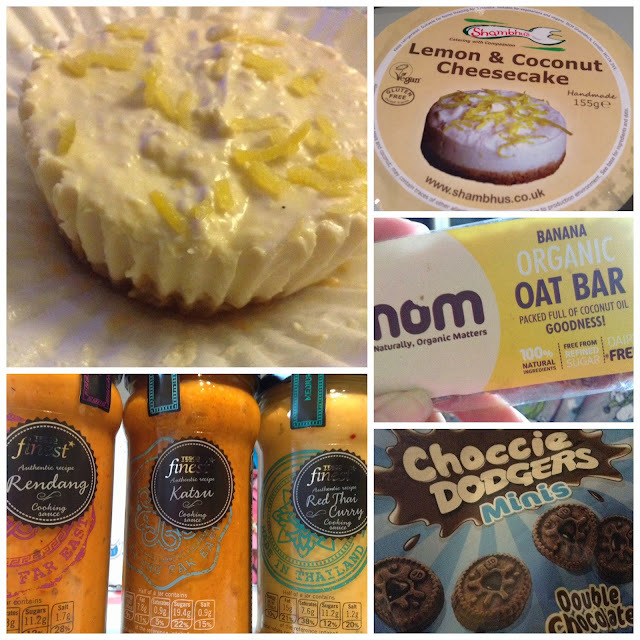 Vegan Lemon & Coconut Cheesecake - A random find in a local health food store. Bit on the pricey side at £3.89 but well worth it. I thought this was the best Vegan cheesecake I'd ever consumed, much nicer than Food Heaven. The ginger biscuit base wasn't soggy or hard and a good individual portion size. I made my boyfriend try it and he didn't turn his nose up in horror (he can eat dairy). The label advised Gluten Free but there was a trace warning. Click here to view website. Choccie Dodgers - my boyfriend surprised me with these biscuits. Basically, they are similar to a bourbon. They are labelled may contain milk, eggs, soya & nuts. These are not suitable for anyone who avoids wheat & gluten. Tesco Finest Sauces - finding a dairy free curry sauce outside of the Free From section can be mission impossible. I hit the jackpot with these three sauces at Tesco. I used the Katsu sauce to recreate Wagamama's Yasai Katsu curry which I'm not able to eat at their restaurants. Have you tried any of these or will you be adding to your shopping list?